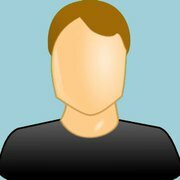 Free audio book giveaway. Your choice of any audio book shown below from Audiobooks.com. No obligations, no hoops to jump through, the gift certificate for your audio book will be sent directly to your registered email. All registered Tekread members eligible, every month. Click the image of the TekRead 5 Star audio book you want. Only one click per month accepted. You will be asked for your name and email address only if you have not registered before. Make sure you are logged in before you make your selection. Ten winners will be selected at random at the end of each month. Click on any one of the 100 audio books shown below to see a summary and hear an audio sample or select your own book by entering Title by Author. When you find the audio book you want click on the “My Giveaway Choice” button to register it for your choice for the month. Delia was born in southern Georgia in 1949, and grew up riding horses in the woods around Thomasville. Her mother, also an outside-girl, encouraged Delia to explore far into the oak forests, saying “Go way out yonder where the crawdads sing.” Her mother taught her how to hike without stepping on rattle snakes, and most important not to be afraid of critters of any kind. Delia went on to spend most of her life in or near true wilderness, and since childhood has thought of Nature as a true companion. One of her best friends. Delia’s strong bonds with the families of a small town and her close relationships with girlfriends have stayed with her all her life. Her novel is dedicated to three friends she has cherished since second grade. These close relationships and Delia’s intimate connections with Nature have influenced her studies and writing. Even at this early age, Delia loved writing. In the sixth grade of her small grammar school, she won first place in a writing competition, and felt sure this meant she would one day be a writer. Since her family spent some of every summer in the mountains of North Carolina, Delia has a special attachment to the wild and beautiful places of that state. Where the Crawdads Sing is based in the lush Carolina coastal marsh. By the time she started university, she had decided to pursue a career in science, instead of literature. She received a Bachelor of Science degree in zoology from the University of Georgia and a Ph.D. in Animal Behavior from the University of California in Davis. Catherine Danielle Clark, known as Kya to her family, and as “The Marsh Girl” to the people of Barkley Cove, North Carolina, is abandoned by her family as a very young girl. She is able to survive with very little assistance from the adult world because of her remarkable resourcefulness. She ”finances” her relatively primitive life style primarily by collecting and selling mussels and smoked fish to the local version of a convenience store. Yet, she remains extremely shy, avoiding contact with other humans as much as possible, not even attending school despite the (half-hearted) efforts of local truant officer. Just before reaching puberty, she meets Tate, a young man who has seen her fishing and collecting mussels. Tate teaches Kya how to read, and she turns into a voracious seeker of knowledge. Kya’s and Tate’s relationship turns romantic, though not sexual, but Tate abandons her to attend the University of North Carolina. The early chapters of the book alternate between Kya’s youth in the 1950s and early 60s and the investigation of the mysterious death of Chase Andrews, a local former high school football star, in 1970. We later learn that Kya met Chase and became his lover on the rebound after Tate abandoned her. The local sheriff develops a rather far-fetched theory of how Kya might have killed Chase, and the final chapters deal with the presumption of guilt about Kya. This presumption is buttressed by the town’s prejudice against the “Marsh Girl.” I can’t tell you how that ends, but the denouement is exciting and satisfying. The book has received rave reviews, and I can see why. Delia Owens has created a collection of well-wrought characters. Kya in particular is very sympathetic, if a little implausible. The author is very effective in describing a believable fictional universe in coastal North Carolina in the area around Barkley Cove. The novel itself is an interesting melding of a coming of age novella with a murder mystery and a legal procedural tale. Highly recommended! The audio book is narrated by Cassandra Campbell and is 12 hrs and 12 mins. 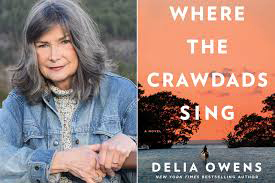 Watch Delia Owens Interview On the Background for Her Latest Book Where the Crawdads Sing YouTube. Celeste Ng is the author of two novels, Everything I Never Told You and Little Fires Everywhere. Her first novel, Everything I Never Told You (2014), was a New York Times bestseller, a New York Times Notable Book of 2014, Amazon’s #1 Best Book of 2014, and named a best book of the year by over a dozen publications. Everything I Never Told You was also the winner of the Massachusetts Book Award, the Asian/Pacific American Award for Literature, the ALA’s Alex Award, and the Medici Book Club Prize, and was a finalist for numerous awards, including the Ohioana Award, the John Creasey (New Blood) Dagger Award, and the VCU Cabell First Novelist Award. It has been translated into over two dozen languages. 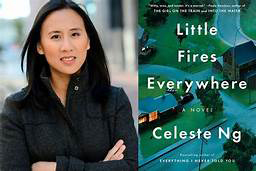 Celeste’s second novel, Little Fires Everywhere, was published by Penguin Press in September 2017, and is a New York Times bestseller, Amazon’s #2 best book and best fiction book of 2017, and was named a best book of the year by over 25 publications. It was also the winner of the Goodreads Readers Choice Award 2017 in Fiction, and will soon be published abroad in more than 20 countries. Celeste grew up in Pittsburgh, Pennsylvania, and Shaker Heights, Ohio. She graduated from Harvard University and earned an MFA from the University of Michigan (now the Helen Zell Writers’ Program at the University of Michigan), where she won the Hopwood Award. Her fiction and essays have appeared in the New York Times, One Story, The Guardian, TriQuarterly, and elsewhere, and she is a recipient of the Pushcart Prize and a fellowship from the National Endowment for the Arts. This incandescent portrait of suburbia and family, creativity, and consumerism burns bright. It’s not for nothing that Ng (Everything I Never Told You, 2014) begins her second novel, about the events leading to the burning of the home of an outwardly perfect-seeming family in Shaker Heights, Ohio, circa 1997, with two epigraphs about the planned community itself—attesting to its ability to provide its residents with “protection forever against…unwelcome change” and “a rather happy life” in Utopia. But unwelcome change is precisely what disrupts the Richardson family’s rather happy life, when Mia, a charismatic, somewhat mysterious artist, and her smart, shy 15-year-old daughter, Pearl, move to town and become tenants in a rental house Mrs. Richardson inherited from her parents. Mia and Pearl live a markedly different life from the Richardsons, an affluent couple and their four high school–age children—making art instead of money (apart from what little they need to get by); rooted in each other rather than a particular place (packing up what fits in their battered VW and moving on when “the bug” hits); and assembling a hodgepodge home from creatively repurposed, scavenged castoffs and love rather than gathering around them the symbols of a successful life in the American suburbs (a big house, a large family, gleaming appliances, chic clothes, many cars). What really sets Mia and Pearl apart and sets in motion the events leading to the “little fires everywhere” that will consume the Richardsons’ secure, stable world, however, is the way they hew to their own rules. In a place like Shaker Heights, a town built on plans and rules, and for a family like the Richardsons, who have structured their lives according to them, disdain for conformity acts as an accelerant, setting fire to the dormant sparks within them. The ultimate effect is cataclysmic. As in Everything I Never Told You, Ng conjures a sense of place and displacement and shows a remarkable ability to see—and reveal—a story from different perspectives. The characters she creates here are wonderfully appealing, and watching their paths connect—like little trails of flame leading inexorably toward one another to create a big inferno—is mesmerizing, casting into new light ideas about creativity and consumerism, parenthood and privilege. With her second novel, Ng further proves she’s a sensitive, insightful writer with a striking ability to illuminate life in America. The audio book is narrated by Jennifer Lim and is 11 hrs and 27 mins. Watch Celeste Ng Interview On the Background for Her Latest Book Little Fires Everywhere YouTube. Sarah Perry was born in Essex in 1979, and was raised as a Strict Baptist. Having studied English at Anglia Ruskin University she worked as a civil servant before studying for an MA in Creative Writing and a PhD in Creative Writing and the Gothic at Royal Holloway, University of London. In 2004 she won the Spectator’s Shiva Naipaul Award for travel writing. In January 2013 she was Writer-in-Residence at Gladstone’s Library. Here she completed the final draft of her first novel, After Me Comes the Flood, which was published by Serpent’s Tail in June 2014 to international critical acclaim. It won the East Anglian Book of the Year Award 2014, and was longlisted for the 2014 Guardian First Book Award and nominated for the 2014 Folio Prize. In January and February 2016 Sarah was the UNESCO City of Literature Writer-in-Residence in Prague. Her second novel, The Essex Serpent, was published by Serpent’s Tail in May 2016. It was a number one bestseller in hardback, and was named Waterstones Book of the Year 2016. It was shortlisted for the Costa Novel Award 2017, and was longlisted for the Bailey’s Women’s Prize for Fiction 2017, the Wellcome Book Prize, the International Dylan Thomas Prize, and the New Angle Prize for Literature. It was broadcast on Radio 4 as a Book at Bedtime in April 2017, and was chosen for the Richard and Judy Summer Book Club 2017. Sarah has spoken at a number of institutions including Gladstone’s Library, the Centre of Theological Inquiry at Princeton, and the Anglo-American University in Prague, on subjects including theology, the history and status of friendship in literature, the Gothic, and Foxe’s Book of Martyrs. Her essays have been published in the Guardian and the Spectator, and broadcast on BBC Radio 4. She reviews fiction for the Guardian and the Financial Times. She currently lives in Norwich, Her third novel, Melmoth, was published in October 2018. Haunted by past misdeeds, a self-exiled English translator encounters the uncanny in snow-covered Prague. Helen Franklin doesn’t deserve joy, so she arranges her own “rituals of discomfort: the uncovered mattress, the unheated room, the bitter tea,” the modern-day equivalents of wearing a hair shirt. When one of her few friends, the scholar Karel Pražan, stops her on the street to share his discovery of a strange manuscript, Helen begins to suspect her past has caught up with her at last. The manuscript contains tales from many sources, and they all detail horrors in various degrees: a young Austrian boy who gets his neighbors sent to concentration camps during World War II, a 16th-century Protestant in Tudor England striving to retain her faith in the face of persecution, a 19th-century Turkish bureaucrat responsible for writing a memo used to justify the detention of Armenian families. In each of these tales lurks the spectral figure of Melmoth, a witness “cursed to wander the earth without home or respite, until Christ comes again.” But why does steady, practical Helen Franklin feel Melmoth’s “cold gaze passing at the nape of her neck”—and what misdeeds from her past have pushed her to the brink of exhaustion? While Helen’s friends—the sharp, wry Thea, a former barrister, the cranky landlord Albína, and the saintly Adaya—worry, the beseeching hand of Melmoth grows ever closer. In rich, lyrical prose, Perry (The Essex Serpent, 2017, etc.) weaves history and myth, human frailty and compassion, into an affecting gothic morality tale for 2018. Like David Mitchell and Sarah Waters, Perry is changing what a modern-day ghost story can look like, challenging her readers to confront the realities of worldwide suffering from which fiction is so often an escape. A chilling novel about confronting our complicity in past atrocities—and retaining the strength and moral courage to strive for the future. The audio book is narrated by Jan Cramer and is 10 hrs and 39 mins. 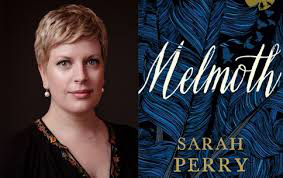 Watch Sarah Perry On the Inspiration for Her New Book Melmoth YouTube. Carlos Ruiz Zafon is a Spanish novelist. His first novel, El Príncipe de la Niebla (The Prince of Mist, 1993), earned the Edebe literary prize for young adult fiction. He is also the author of three more young adult novels, El Palacio de la Medianoche (1994), Las Luces de Septiembre (1995) and Marina (1999). The English version of El Príncipe de la Niebla was published in 2010. In 2001 he published the novel La Sombra del Viento (The Shadow of the Wind), his first “adult” novel, which has sold millions of copies worldwide. Since its publication, La Sombra del Viento has garnered critical acclaim around the world and has won many international awards. His next novel, El Juego del Angel, was published in April 2008. The English edition, The Angel’s Game, is translated by Lucia Graves, daughter of the poet Robert Graves. It is a prequel to The Shadow of the Wind, also set in Barcelona, but during the 1920s and 1930s. It follows (and is narrated by) David Martin, a young writer who is approached by a mysterious figure to write a book. Ruiz Zafon intends it to be included in a four book series along with The Shadow of the Wind. The Third book in the cycle, El Prisionero del Cielo, appeared in 2011, and was published in English in 2012 as The Prisoner of Heaven. Ruiz Zafon’s works have been published in 45 countries and have been translated into more than 50 different languages. According to these figures, Ruiz Zafon is the most successful contemporary Spanish writer (along with Javier Sierra and Juan Gomez-Jurado). Influences on Ruiz Zafon’s work have included 19th century classics, crime fiction, noir authors and contemporary writers. Ruiz Zafón brings his sprawling Cemetery of Forgotten Books tetralogy to a close that throws in everything but the kitchen sink, but that somehow works. It’s a very nice touch—spoiler alert—that the female lead of Ruiz Zafón’s latest should use a pen to do in a bad guy in a spectacularly gruesome way: “He collapsed instantly,” he writes gleefully, “like a puppet whose strings had been severed, his trembling body stretched out over the books.” Books are everywhere, of course, inasmuch as this story begins and ends in the hands of the bookseller Daniel Sempere Gispert, who, as ever, is caught up in stories that are in part of his own devising and in part the product of other storytellers—altogether very Cervantesque, that. The story begins in the crucible of the Spanish Civil War, when a very young Alicia Gris, that female lead, comes into the orbit of Fermín Romero de Torres, himself a bookish fellow who connects to Alicia immediately through her love of Alice’s Adventures in Wonderland: “Anything to do with falling down a hole and bumping into madmen and mathematical problems is something I consider highly autobiographic,” he tells her. Fermín harbors secrets: As readers of earlier volumes will know, he has been imprisoned as a spy in Franco’s jails, and a certain jailer who has risen in the ranks of the postwar Nationalist government is due for some payback—retribution that involves, yes, books and writers and literary clues and all manner of puzzles. Ruiz Zafón clearly has had a great deal of fun in pulling this vast story together, and if one wishes for a little of the tightness of kindred spirit Arturo Perez-Reverte, his ability to keep track of a thousand threads while, in the end, celebrating the power of storytelling is admirable. Take that pen, for instance, which “is like a cat—it only follows the person who will feed it.” Even, it seems, if that food is vitreous fluid…. A satisfying conclusion to a grand epic that, of course, will only leave its fans wanting more. The audio book is narrated by Daniel Weyman and is 27 hrs and 55 mins. 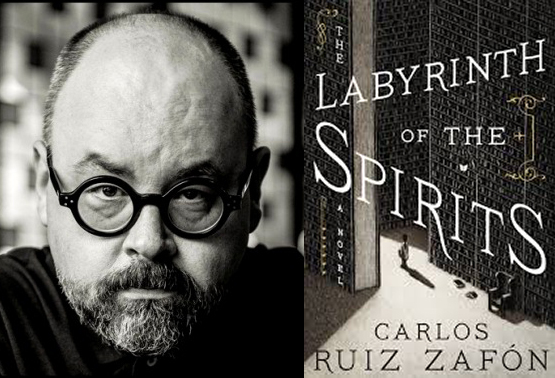 Watch Carlos Ruiz Zafón’s interview on writing the series Cemetery of Forgotten Books YouTube. Rebecca Kuang immigrated to the US from Guangzhou, China in 2000. She is currently studing Chinese history at Georgetown, where her research focuses on Chinese military strategy, collective trauma, and war memorials. She is a 2018 Marshall Scholar, and will be heading to the University of Cambridge next fall to do her graduate studies. Fiction-wise, She graduated from Odyssey Writing Workshop in 2016 and attended the CSSF Novel Writing Workshop in 2017. 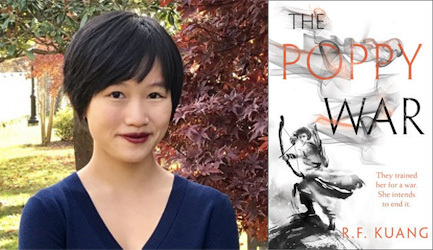 Her debut novel, The Poppy War, is the first installment in a trilogy that grapples with drugs, shamanism, and China’s bloody twentieth century. In Nikan, opium opens the gateway to the gods. Confined to their Pantheon in the spirit realm, they can only hope to influence the choices of those on earth with whispered promises through the haze of pipe smoke. For Rin, an undersized orphan, the thought of communing with the gods is terrifying. But as the drums of war begin to beat in R.F. Kuang’s extraordinary debut novel The Poppy War, Rin discovers that a day might come when she has no choice. After testing into Sinegard, the most elite military academy in Nikan, Rin Fang discovers she is special. Through training with a seemingly insane professor, her shamanistic ability to conjure fire starts to blossom. When Mugen, a militaristic empire who defeated Nikan in previous Poppy Wars, invades their homeland, the students find themselves dispersed into the middle of a horrific ground war. Rin, conscripted into a misfit band of shaman outcasts, must fight both the ever-advancing Mugen army and her increasing sense that something inside her desperately wants to escape. Her sanity might be the price of finding the answers. R.F. Kuang must first be congratulated on seamlessly drawing on and then reshaping Chinese history as influence for the world Rin inhabits. Martial arts sparring sessions and colorful street parades instantly conjure images of western Asian culture, but at no point does this world ever feel like a simple reflection of our own. Nikan’s richly detailed culture and history feel substantial and authentic, supporting the characters’ actions as the war unfolds. And when that war begins, it’s almost shocking in its realness. It is not a conflict fought far away as Rin sits idly in a classroom. The violence is immediate, visceral and wrenching, pulling on the reader’s sense of disgust and anger. The “war is hell” trope plays out solemnly and intimately here, leaving no character untouched. By the climax of the narrative, everyone the reader meets is scarred. Thank goodness we have Rin to lead us through it. Her tenacity, stubbornness and insecurity are instantly sympathetic and Kuang’s attention to Rin’s feelings opens up oceans of emotional depth. There’s a definite weight to Rin’s conflicting choices that only builds as the suspenseful final act plays out. It would be a thrill to see Rin, fresh from the crucible of The Poppy War, on the pages of a sequel novel. With such a brilliant start, one can’t help but think how certain hers and Kuang’s futures surely are. The audio book is narrated by Emily Woo Zeller and is 18 hrs and 57 mins. Watch Rebecca Kuang’s interview on her novel The Poppy War YouTube. Powered by WordPress | Copyright © 2019 . | All Rights Reserved.